Storefronts and 63 apartments are proposed for the empty lot at 1822-50 W. Chicago Ave.
For the Nov. 5 membership meeting, Wells High School Principal Ernesto Matias will be guest speaker. Artist Layne Jackson will present the business minute; she recently relocated her art shop from the Miller Lumber building to Ashland Avenue between Cortez and Haddon. There will be a community group discussion regarding the lifting of liquor moratoria on Ashland. The moratoria affect liquor stores, convenience stores etc. Restaurants can sell liquor regardless of a moratorium. The meeting will take place at 6 pm Oct. 17 in the Bedford, 1612 W. Division St.
EVA would like to explore extending the Chicago Avenue pedestrian designation east to Noble Street. 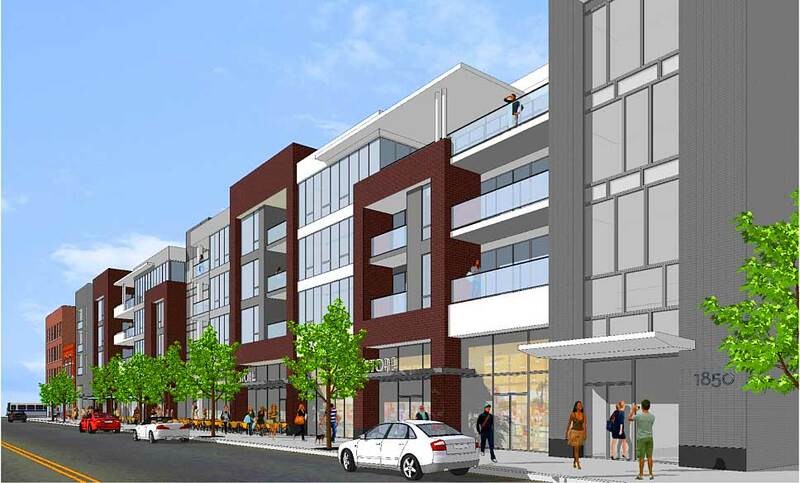 There is currently an empty lot at Noble, with a proposal for a 7-Eleven with surface parking. This is not the street-oriented development we would like to see. Eckhart Park Advisory Council and Ald. Proco Joe Moreno should be a part of the discussion. Developer Chris Fifield, along with his zoning attorney Richard Klawiter from DLA Piper and senior associate Brian Kidd from Pappageorge Haymes Partners, presented their proposal for a mixed-use project on the empty lot at 1822-50 W. Chicago Ave. The project is under the contingency that they can get a zoning change to allow more units. As of right the building could be built as 35 condo units, but the current proposal is for 63 rental apartments (9 studio, 33 1-bedroom, 21 2-bedroom) with an average of 794 square feet. The core issue is the number of units and parking spots. The 4,000 square feet of retail space could be leased as 1 to 7 retail spaces. On the ground floor there is an additional 6-foot setback to accommodate restaurant seating. A question was raised whether this is allowed per code. Denying rumors naming Trader Joe's as the first-floor tenant, Fifield stated that there have been no discussions with retailers yet and that Trader Joe's is not interested in the site. With the higher density, Fifield is trying to hit an unfilled niche in the East Village market. Research indicated a shortage of and demand for 1-bedroom rental units. Developers stated that increasing density along commercial corridors brings residents who will spend money in the community, especially as the neighborhood grows. Board member Greg Nagel agreed that more bodies could spur additional Chicago Avenue development and that members of the EVA board have not been satisfied with the growth pace over a decade. The project was first planned as 80 units and has since come down to 63; 10% of the units are required to be affordable, but Fifield may pay the city $100,000 per unit to not have these units on site. The rezoning process would begin in late fall or early winter. The project will not and likely cannot be converted from rental to condos later on. If the zoning and permit process goes as planned, Fifield would like to start construction in May or June 2013. Comments were made stressing that EVA does not want Chicago Avenue to copy the intensive restaurant/sports bar scene on Division Street. People also are interested in keeping the vintage character of Chicago Avenue, pointing out that on Division few vintage storefronts are empty but many new ones are. Because of the pedestrian designation on Chicago Avenue, no curb cuts are allowed, and the rear alley is narrow, leading to concern about how parking would be addressed. Fifield stated that both residential and retail parking would enter through the alley to parking on ground level and a mezzanine above. A loading dock also is required for retail. Developers would like to accommodate a valet for a restaurant or in-and-out parking for something like a dry cleaner. There would be 87 total parking spots, which is more than needed for both residential and retail. This breaks down to 16 retail and 27 residential spots on the ground level, and 44 residential spots on the mezzanine. Fifield pointed out that if the current zoning remains, there would be a higher retail parking requirement. However, EVA planning co-chair Scott Rappe pointed out that the Chicago Avenue pedestrian designation also would allow a parking reduction. Further concerns were raised over an increase in traffic flow, emissions and noise next to Commercial Park, and whether large trucks could maneuver to 1 large or 7 small retailers. Fifield assured that a traffic consultant and the city Department of Transportation would explore these issues. Developers plan to revisit EVA in a month to address traffic concerns. A representative from Chicago Grand Neighbors Association stated at the meeting that his group supports the money coming into the neighborhood but feels the project is excessive. The proposed height is about 58 feet; the H&R Block building at the west end of the block is 56 feet. Overall, the primary concerns were the increase in traffic on Wood, Wolcott and the alley, and the noise, emissions and aesthetic next to Commercial Park. Fifield stressed that the project is a work in progress and developers want to work with the community to make it the best project for the neighborhood. They will keep in touch with committee co-chairs Scott Rappe and Peter Locke as plans develop. There has been some discussion whether specific areas can be removed from the new SSA application per the wishes of those in the neighborhood. A compromise seems to be available, and it looks like the application can be changed by removing certain portions from the newly proposed boundaries. EVA is trying to get in communication with the alderman and SSA commissioner to discuss the removal. EVA has been invited by Ald. Moreno’s office to discuss concerns about the Evil Olive nightclub on the Polish Triangle at 1551 W. Division St. Ziggy Dyrkacz from Chopin Theatre has gathered many community members concerned with the impact of the club and are looking to possibly bring a public nuisance case. Board Members – Neal McKnight, Peter Locke, KK Goh, Meghan Quinn, Greg Nagel, Gladys Anselmo, Scott Rappe, Stephen Rynkiewicz, Tom Tomek. Non-Board Members – Dan Johnson, Nick Peterson, Aaron Swerdlove, Michael VanDam, Daniel Laskowski, John Herbst, Alisa Hauser, Russ Gardner, Vanesa Lyon, German Llanos, Ela Biedziuk. Meeting commenced at 6:35 pm at Leona's Restaurant, 1936 W. Augusta Blvd. Meeting adjourned at 7:50 pm. Any idea what is going up at 1801 W Chicago? EVA has not been contacted regarding the site, and nothing has been permitted so far.